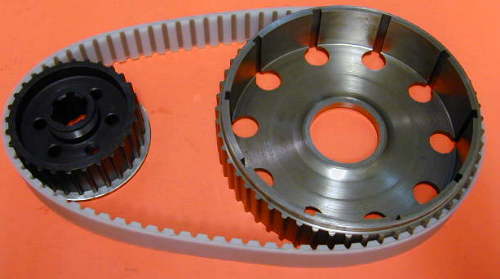 Sprocket for all Triumph 5 speed gearboxes, twins and triples. Please choose number of teeth. British made belt kit for T140 and TR7. Replaces the triplex chain and the clutch drum. The oil resistant Synchroflex belt is extremely strong, light, silent and durable. You can use the original clutch plates and components. It can run dry or in oil.